It’s not often you find a restaurant so completely dedicated to the quality of what they serve that they commission their own swordfish harpoon boat to ensure they can personally source the finest quality seafood. Such is the case with the Bluewater Grill restaurants. The Bluewater Grill has its own fishing vessel called the Pilikia with the sole purpose of ensuring the restaurant can offer its customers the finest and freshest seafood available. I call that dedication! With that kind of passion and commitment, it’s no surprise that the Bluewater Grill is celebrating its 20th year in business. Established in Newport Beach, California in 1996, by partners and still current owners Rick Staunton and Jim Ulcickas, Bluewater Grill has grown into a family of seafood restaurants committed to serving pristine quality seafood, sustainably caught and classically prepared with a modern twist. And, if they’re not catching the fish themselves, they only purchase directly from fisherman at the peak of quality and freshness. Ensuring the legacy of the Bluewater Grill is upheld, is the job of Executive Chef Jason Mazur. With 8 locations, all in competitive resort communities and all offering more than 40 varieties of seafood, this is no simple task. However, Chef Mazur is definitely the perfect man for the task. 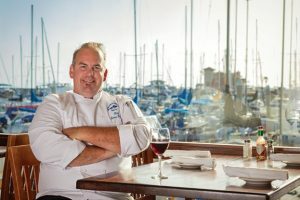 With an extensive culinary background in several high profile restaurants such as McCormick and Schmidt’s, Neiman Marcus and the Original Fish Company, and as a local of Orange County himself, Chef Mazur knows exactly what his customers want – fresh local fish at a reasonable price with a modern New England twist. This might sound fairly straight forward but it’s anything but simple. To execute and deliver the food his customers have come to expect means Chef Mazur must master not only menu development and execution but spec adherence, food/labor costs, menu updates and the many other details of running a highly successful kitchen. That’s no small order but Chef Mazur does it with ease. With the recent opening of Bluewater Grill on Catalina Island, Chef Mazur has begun what he calls a “Modernization” of the restaurant family. 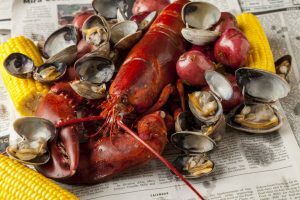 Essentially, he plans to continue to offer the same quality of food his customers have come to expect but elevated in a way that also attracts a “younger, savvy foodie type.” Signature dishes such as the Chipotle Blackened Swordfish and Whole Lobster Clam Bake (recipes below) are perfect examples of this unique menu elevation. Chef Mazur explains that he’s been able to do all this and keep the menu pricing in-line by focusing on what really counts – “THE FOOD!” The formula, $.70 of every dollar goes to food vs. alcohol and finding the right balance between what his long-term customers have come to expect while also offering new menu features to attract an all new kind of customer. Practically speaking, it means knowing for example that his customers at the original Newport Beach location want “a less constructed more traditional plate presentation” while customers at some of the newer locations, like Catalina and Coronado, want a “tighter more modern plate presentation (stacked food).” Understanding this diversity and then successfully navigating and managing it, is exactly how Chef Mazur ensures the legacy of this fine establishment will continue on. The incredible success of the Bluewater Grill is truly no surprise. It’s obvious from the minute you walk into any Bluewater Grill location that there’s this passion for providing only the best seafood and customer service. It starts from the very top with the owners and a good deal of management being avid fishermen themselves, and trickles down through every aspect of the restaurant from the front to the back of the house. Everyone, is friendly and knowledgeable and it’s never hard to find the Chef and/or manager on the floor making sure that the customer has the very best service and experience possible. It’s truly a well-run ship! Additionally, the impact they’ve had and continue to have on the community with their extensive support of the Susan G. Komen Foundation (www.komen.org), raising over $700,000 at one event alone in 2016, puts them in a league of their own! It’s no wonder the community continues to embrace and support their growth. Success seems apparent for Chef Mazur and the Bluewater Grill and we’re confident that they will continue to successfully change and grow in their highly competitive market. We look forward to being a part of their journey for years to come! To contact the Bluewater Grill go to www.bluewatergrill.com. 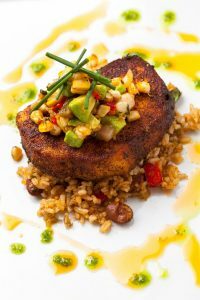 All of us at Rogers Poultry would like to thank Chef Mazur and the Bluewater Grill for their ongoing support as a loyal customer and for the wonderful insights they provided allowing us to write such an interesting article. We hope it’s provides some value to our readers and invite all of our customers to participate in our Customer Spotlight. If interested, simply contact your Rogers Sales Associate or call us toll free at 800.889.8280. 2) Place the clams and 10oz of the potato corn water into a covered saute pan and bring to a boil. Cook until clams open.